My goodness, it's been a month since I did a report on a Speyside single malt. 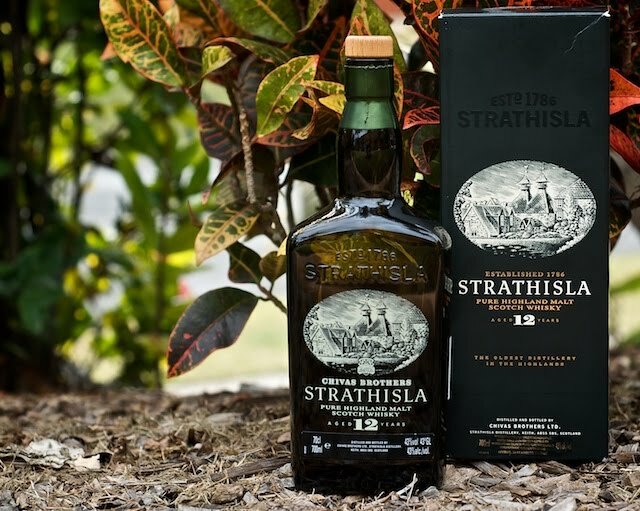 So it would be my great pleasure to present the Speysider known as Strathisla 12 year old Single Malt. 1786 - The distillery, then named Milltown, was founded by George Taylor and Alexander Milne. The malt that Milltown produced was named Strathisla. "Strath" is Gaelic for "shallow valley" and "Isla" is the name of the river running through that valley. 1825 - Distillery was renamed Milton, after the nearby Milton Castle, by new owners MacDonald Ingram & Co.
1830 - Another ownership change: William Longmore & Company Ltd.
1870 - Distillery renamed: Strathisla. 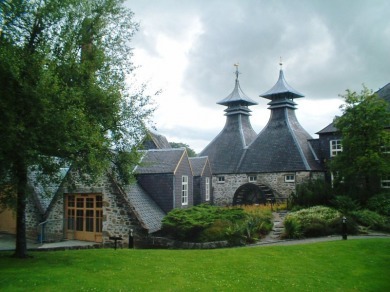 Since its purchase by Chivas, the vast majority of Strathisla's malt goes into the Chivas blends. In fact, it may be the main malt for those blends since its vistor center is centered around "The Ultimate Chivas Experience". To be honest, I've yet to be wowed by a single malt from Chivas-owned distilleries, though I have yet to try Abelour's cask strength bottlings. 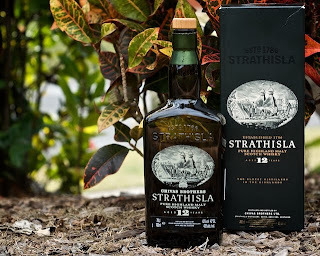 But I always have an open mind for the amber restorative, so let's try the Strathlisa 12. I had a chance to try this at the Belmont Brewing Company down the road from our condo. As always, I got a decent pour for my money. (Much obliged, BBC.) This allowed me to try it both neat and then with 2 tsp of water. The color is like a nice golden lager with a little bit of auburn in its heart. The nose is Macallan-Sherry-Oak-lite along with lots of maple syrup, cinnamon, and apple juice. The palate brought the big surprise: Lucky Charms "marshmallows"! Seriously. Didn't trust the first taste, so I tried again. Yep, Lucky Charms "marshmallows". If you've had the Charms, you understand my quotation marks. The "marshmallow" experience follows a nice bit of salt up front, then a hint of frosting at the end. Apple cider and molasses make up the medium-length finish. The nose goes bland a bit. Sort of like a generic Speyside sherry finish. Think Chivas Regal. Salt has now been washed away from the palate. Mild as a blend again. The texture and flavor is creamier. A hint of toast, a smidgen of cherry. The finish, all gone. Nothing to be found. On a side note, the bottle is very cool: dark and rectangular with a nice etching of their distillery. Much cooler than Macallan 12's bottle. But the whisky within can't top Mac 12, in my book. BUT, it's still pretty good. A reliable drink. It won't shout nor give you bad-whisky-face. Might even be cheaper than Mac at a bar. So I'm not going to stomp all over this one. I'm grading it on its neat performance because the good parts of the Strath 12 wash away with any water.